On Sunday 9th February 40 bowlers met in good conditions to honour the late Bell Werchon. This day is held annually, with the money raised going to the Millicent Hospital. Werchon family members who live in the district were the sponsors for the day. Bell’s daughter, Dawn Atkinson, announced that $ 550 had been raised, and this would be passed on to the Millicent Hospital. Winning team was lead by Jan Buhlmann, with Alby Cecotti and Maureen Elton. Runner-up team being Brian Atkinson (skip), Heather Carthew, Allan Correll and Carol Gibbs. Millicent team mates played off in the final of the “Ladies’ Plate”. On 12th Feb the final of the “Ladies Plate” was contested between Fay Richards and Adriana Ross. This event is sponsored annually by Merle Stevens and Shirley Buhlmann. Participants are those with handicaps ranging from 8 to 16. Finalists were Fay Richards and Adriana Ross who have played in the same Pennant team all season. It was” game on,” with Fay, always an excellent competitive draw bowler and Adriana, who, as a first year bowler has shown outstanding talent. Both players put on an excellent display of draw bowling, with neither player being very far from the kitty at any given time. It was Adriana who went on to win the match 21 shots to 14. Thursday 13th February saw the return of numbers for the Hahn 2-4-2 at the Millicent Bowling Club. 42 bowlers (making up 18 teams of pairs & 2 teams of triples) took part in the competition in much milder conditions than we have been experiencing lately. There was an anomaly with 2 teams tying for first place & 2 teams tying for third place. Finishing on 34+14 was the team of Alan Strother & Ian Ross & the team of Alby Cecotti & Glenn Schapel. On a count back the Strother/Ross combination scored 69.4% winning over the 68.4% of the Cecotti/Schapel team. Sharing third place on 33+16 were the teams of Alan Correll & Peter Scanlon & Colin Pye & Herb Henderson. The other winning teams were Bill Fennell & Steve Carnellor (32+12), Derek Bowering & Marino Gandolfi (31+6), Max Richards & Bill Davis (31+4), Chris Earl, Bob Baxter & Peter Varcoe (31+3), Manny Vanderhorst & David Botting (30+5) & finally Jim Godden & Malcolm McRobert (29+4). The raffle prize of the Millicent Quality Meat’s meat tray went to Peter Scanlon & Peter Varcoe won the bottle of wine. Congratulations to all who took part in today’s play. At the recent ‘Country Carnival’ the Millicent team of John Scudds, Iain Campbell, Rod Gibbs & John Buhlmann had to play a team from Port Neill. This team consisted of 3 Port Neill bowlers & 1 ex Port Neill (now a Millicent) bowler, Nipper Horne. The game was for 10 ends &, at the completion of 9 ends, Port Neill were ahead 18 to 3. For those that haven’t heard the final outcome it was 18 to 11 because the Millicent team scored an 8 on that last end! After our Pennant matche on Saturday 15th February Nipper was given the privilege of presenting John Scudds, Iain Campbell & Rod Gibbs with their “8 Badges”. Unfortunately John Buhlmann was not at the clubrooms to receive his badge but, I’m sure, he would be thrilled to know that Nipper had to acknowledge the achievement of his & his fellow team mates. 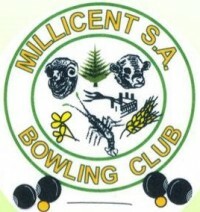 Categories: Bowls, Community Groups, Location, Millicent, Sport, Wattle Range | Permalink.